Bandhavgarh National Park is situated at a distance of 164 km from Jabalpur and 237 km from Khajuraho spread at an area of 448 sq. km. The forest of Bandhavgarh can be classified as moist deciduous, and the National Park holds all those animal species that are typical of this habitat Central India. Certain areas of the park are drier in character, and hold such species as the Nilgai and the Chinkara. Sal forest occurs throughout the valleys, giving way to mixed forest that occurs where the soil is of relatively poor quality on the upper hill slopes, on rocky outcrops and in the South and West. Grassy meadow patches occur in the valley and along the nalas. Bandhabgarh is densely populated with tiger and other wildlife species. The great Gaur or Indian Bison, can be seen with ease, as they come onto the meadows to graze at dusk; Sambar and Barking Deer are a common sight, and Nilgai are to be seen in the more open areas of the park. 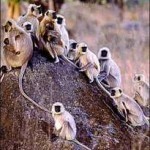 There are more than 22 species of mammals and 250 species of birds. Common Languors and Rhesus Macaque represent the primate group. Carnivores include the Asiatic Jackal, Bengal Fox Sloth Bear, Ratel, Grey Mongoose, Striped Hyena, Jungle Cat, Leopard and Tiger. 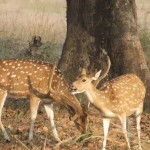 The artiodactyls frequently sighted are Wild Pigs, Spotted Deer, Sambar, Chausingha, Nilgai, Chinkara and Gaur. Mammals such as Dhole, the small Indian Civet, Palm Squirrel and Lesseer Bandicoot Rat are seen occasionally. Among the herbivores, Gaur is the only coarse feeder. The vegetation along streams and marshes is rich in bird life. The vegetation along streams and marshes is rich in bird life. The common ones are Little Grebe, Egret, lesser Adjutant, Sarus Crane, Black Ibis, Lesser Whistling Teal, White-eyed Buzzard, Black Kite, Cested Serpent Eagle, Black Vulture, Egyptian Vulture, Common Peafowl, Red Jungle Fowl, Dove, Parakeets, Kingfishers and Indian Rollers. Reptilian Fauna include Cobra, Krait, Viper, Rat snake, and Python, Turtle and a number of lizard varieties, including Varanus. There are two main ways of getting about in the park in a motor vehicle or on elephant back. 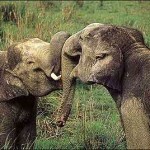 Many of the animals are now accustomed to both; even so, it is best to talk quietly and not make rapid movements. Jeep safaris are best undertaken from dawn until about 10 am and from about 4 pm until dark, as the animals are most active during these periods. A forest Department guide must always accompany you. This guide will be able to direct you and point out wildlife. Elephants are used every morning by the Forest Department for Tiger-tracking. If a Tiger is found, then the elephant will take you directly to the Tiger either from the lodge or from a nearby point reached by jeep/car. This entry was posted in Bandhavgarh National Park, Madhya Pradesh and tagged bandhavgarh forest, bandhavgarh india, bandhavgarh map, bandhavgarh national park india, bandhavgarh national park map, bandhavgarh national park tour, bandhavgarh safari, bandhavgarh wildlife sanctuary, elephant national park, how to reach bandhavgarh national park, india national park, indian national park, tiger bandhavgarh, tiger national park, wildlife national park. Bookmark the permalink.